Background: In the far future, when mankind has flooded the universe, intergalactic colonisation will reach a point where people can have their very own moon, astroid or even planet, simply because there are millions of worlds and just too few people to occupy them all. Alien life has not yet been discovered (at least, not with any intelligence beyond plants and primitive animals). Although owning a planet might be easy, actually living on it in often harsh or at least unfamiliar circumstances isn't cheap. Getting there and setting up a basecamp will allready drain most settlers of their savings, so there is not much money left to put any satelites in orbit or set up any other sophisticated way to observe and explore ones property. Most settlers will therefore have to do with a pretty simple (meaning: not a luxury yacht that get them wherever they want in an instant) exploration vehicle. Also, while watching your planet from a distance could be interesting, most settlers prefer to go for the adventure and explore the old fashioned way by going there themselves. 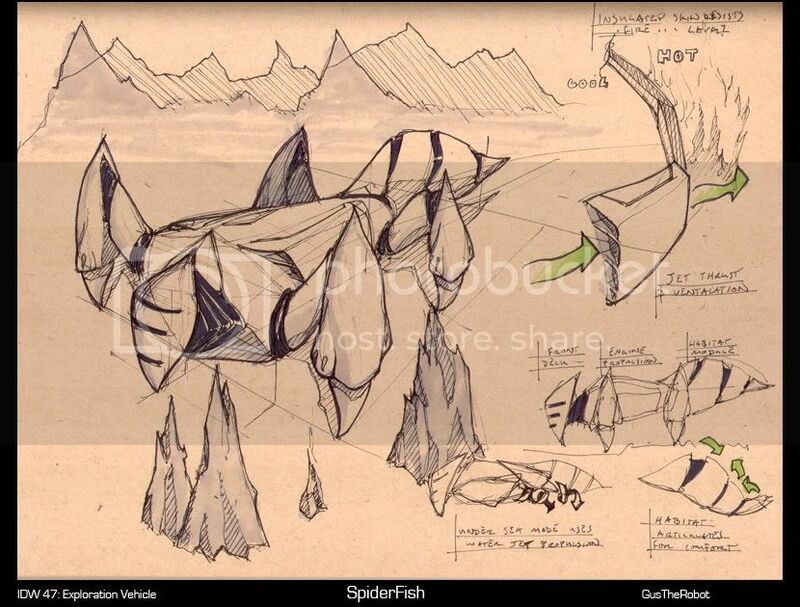 There are a few basic functions that this vehicle needs have: Not only does it need to be able to cross any terrain, withstand any weather condition or atmoshpere, but it also acts as a forward base, mobile home and laboratorium. 1. Design an exploration vehicle. 2. The most important constraint is that it should move over land and/or water. I don't want to see any fancy spaceships or aircrafts. Hovercrafts are ok though. 3. It has to incorporate the functions as mentioned in the background story. 4. Optional: Show the main hazards of the the environment your vehicle is going to operate in or show the environment with the vehicle in it. Last edited by yoitisi; October 6th, 2007 at 10:11 AM. The deadline is before the posting date? Cervel: Aw crap It was kind of late when I put it up...I edited a couple of other details as well. Last edited by yoitisi; October 6th, 2007 at 10:13 AM. I'll post full description when I finish it, but right now, what I can say is that it's a mobile tower. It will mostly travel upright, either over water, or ground. It can, though, reclinate and go horizontal to pass through smaller areas. Tank wheels can be brought outside, by bothe sides of each segment, except for the rear one, which can be up to four, being 2 of them bigger than the rest of them all, the ones used for regular locomotion, and also, they are paired (as you can see in the sand marks). Claws and drills can pop out of his sideways as well for climbing purposes, or just collecting. The vehicle has high pressure resistence so that it could travel even to the center of a planet, or in the most deep waters. Each segment has one particularity, the top one is the control area, which assigns every control for the vehicle. The second one is the lab, where it maintains some cages and receptacles for obtained items. The third one is a compact house, which can handle up to 10 people insid eit with no problems. Te bottom one is macine only, since it has most gears, motors and wheels there. Had a little time myself to play with the topic. This is still a fairly quick sketch, if I find the time I'll try to make something more finalized this time. nice yotisi - I love your freehand ovals. Nice design and some cool details. Cervel - I like the unique approach to the old mining vehicle. I agree with Cervel's comments. Legato: That is indeed some inspiration. I've seen it before (I think the website of Blur Studions hosts one with higher resolution and better sound, I'll try to find it ) but it gives some new ideas. Thanks for putting that up. Deviousg: Thanks. They're officially called ellipses by the way, nitpicking #@&#37;^ that I am . Last edited by yoitisi; October 9th, 2007 at 05:02 PM. Deviousg: Thanks. They're officially called ellipses by the way, nitpicking #@%^ that I am . Here's my rough, I had something in mind almost as soon as I read the concept, but it' been like pulling teeth to get it on paper. I like your design Yoitisi. Last edited by RadioactivePJ; October 10th, 2007 at 08:21 PM. here's what i got right now. pretty sketchy but it gets the idea across. 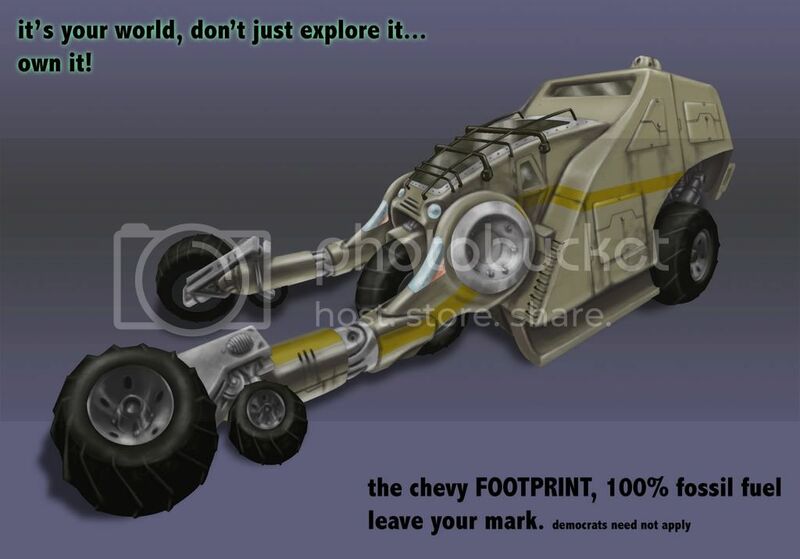 i wanted to take this towards a mass produced, mass marketed vehicle, much like the honda civic of planet exploration. to do that i wanted to make something that could tackle just about any terrestrial terrain (is that redundant? 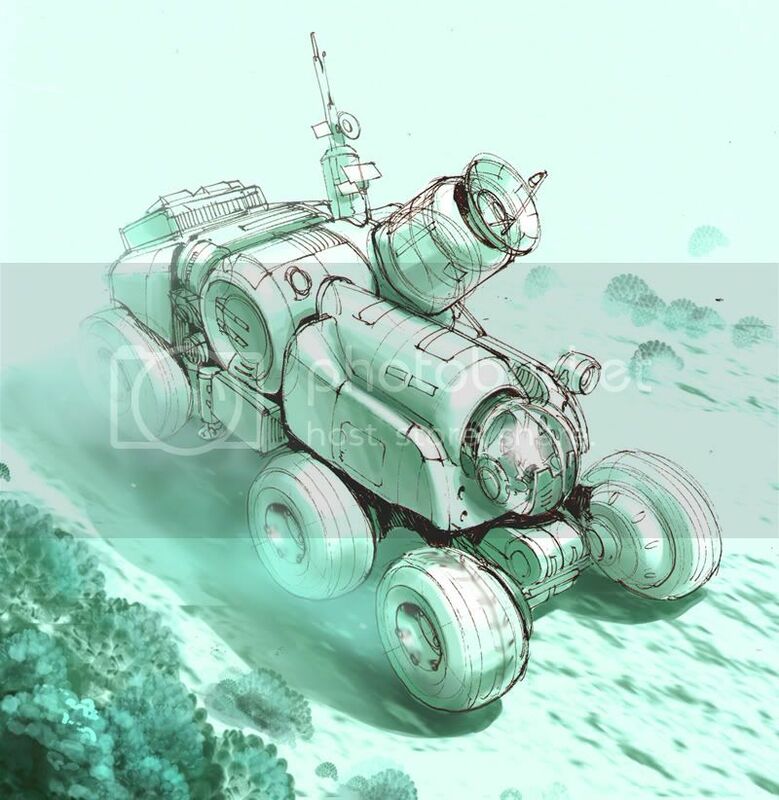 ), so in that pursuit maximum ground clearance was paramount, however to work on the greatest possible array of environments each vehicle would have to be fairly specialized for its intended environment. to tackle that, i went with a modular design. the core vehicle is the forward cab and flat rear, and undercarriage/hydraulics. to adapt to the planet's climate, atmosphere and biology, the back power-plant, intakes, heating, cooling and communication are all modular, allowing the engine to take advantage of various atmospheres if present, or to allow better heat retention in Arctic climates and better cooling in harsh deserts. this modular based design also extends itself to a limited degree to the wheels which each contain their own individual motor and can be tailored to any conditions present including heat dissipation, retention etc. crew accessible areas include a small lab (forward of the airlock/door), sleeping/living quarters opposite side, cabin (which is the only part of the vehicle kept level during movement) and connection tube which leads to a utility access into the back. "designed to be mass marketed to fledgling explorers hot off of blowing their savings on some usually god forsaken rock, this [insert fancy sounding product name here] provides a mass producible core with fully modular power-plant allowing a huge level of adaptation to a vast array of environments"
Last edited by Legato; October 13th, 2007 at 02:02 AM. GusTheRobot: Nice to see some genuine marker/pen sketches in here. I like the general idea but I'm wondering about the actual explorers. Where would they be seated? Also, the meaning of the hot/cool sketch is a bit lost on me. I have no idea what it is about. Legato: You're getting there I like the addition of the people and the little creature, it really adds to the idea of exploring new worlds. However, you still have the same problem with colour and contrast: on vehicles it often works best to have the most detail up front as well as the warmest colours. The same applies to contrast. The cast shadow on it's chassis/understructure could be more tight and dark I think. the vehicle isn't too long, heck, its almost a square, so i consciously decided against your past advice for a loss in saturation towards the distance of the vehicle just due to its size. i did however attempt to do a background using that technique. Workers.... right.. we were working with amoebas right? Or gelatinous goo people? Seriously though i'll have to put together an orthographic of the interior to really give everyone a good idea of how the structure is built/connected. As far as the hot/cold bit goes i initially had this great idea of giving it thermal insulation skin that generated power from the heat, but that didn't really go anywhere. And now because it's a pen sketch i can't exactly erase that bit. BLAST! I'll draw some more stuff up later if i get the time, possibly refine it a bit to be more realistic. Any possibility of an extension, another hour and a half and I'll have something worth looking at. Here's my final, no time for a background, sorry to be such a slacker. In the meantime, I suggest you all check the Topic Suggestion threat. Last edited by yoitisi; October 17th, 2007 at 04:45 AM.